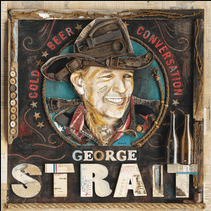 George Strait’s new album, ‘Cold Beer Conversation’, has finally been released in the UK. The album, which was released on 25th September in the US, reached #1 in the Billboard Country Albums Chart, and #4 in the US All-Genre Chart. This is Strait’s 29th studio album, and it features the single ‘Let It Go’ which peaked at #29. Despite retiring from touring, he is set to play a series of shows at the brand new Las Vegas Arena in 2016.